Click on the image to see all the videos from my first year of quitting alcohol. See the highs and the lows right from the first week. Kevin used to be your typical Irish drinker. As a user for over 30 years, he always believed that alcohol was a part of his identity, his culture, and his life. Like so many others, he regarded his own lack of control to be at the root of his alcohol problems. After several unsuccessful attempts at moderation, he came to the conclusion that the trouble lay within himself, not the alcohol, and that he was an alcoholic. Life was not looking too good. His health was suffering, the hangovers were getting longer and harder, he was unfit, overweight, and just wasting away in general. But the most pain came from realizing that his drinking made him a terrible role model for his teenage son. Everything else he could handle, the idea that he might be leading his son down the same destructive path was unforgivable. With that devastating realization, the decision to stop was immediate and permanent. 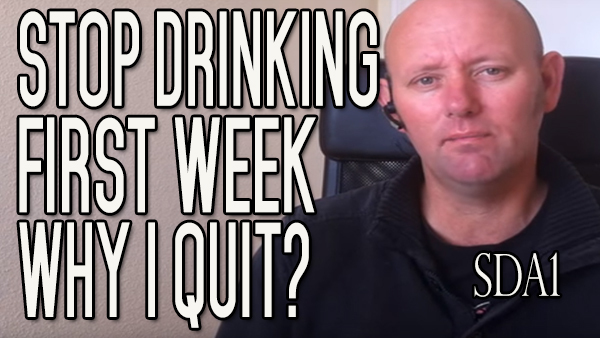 Kevin's message, and that of his website - alcoholmastery.com, is straightforward: you don't have to do anything to quit drinking, you just don't put any more alcohol into your mouth. For most people, the difficulty in quitting is not in the withdrawal, the recovery, or the addiction. The difficulty is in how to live an alcohol free life. How do you fill all those gaps that drinking alcohol used to fill? How do you celebrate without raising the toast or getting drunk? How do you find enjoyment without alcohol? How do you refrain from drinking while everyone else is devouring the stuff? How can you ever be happy as a non-alcohol-user? It's not as difficult as you might imagine. You weren't born with the alcohol thirst, you've learned it. The secret to successfully quitting this habit is as simple as learning some new skills. You will learn more desirable ways of thinking and dealing with your life. Step by step, and day by day, you will engineer the changes for a happy, healthy, and fulfilled life. What separates Kevin from other teachers in the field of quitting alcohol is his ability to break down complex ideas into a no-nonsense, straight talking, and down to earth approach. His up front coaching style is developed around breaking down your alcohol perceptions, rethinking your relationship with alcohol and its use within our society. He won't promise you an easy ride, but he will deliver genuine step by step strategies that you can implement in your life right now. You can find his weekly self help videos, shot while hiking through the hills of Alicante, Spain, at www.alcoholmastery.com. He also hosts the weekly Alcohol Mastery Podcast.